Every day, scientists around the world are using water for a multitude of purposes. But the quality of this reagent is too important to ignore - contaminants and variabilities in laboratory water are putting too many results at risk. What’s In Your Laboratory Water? Water is used for a myriad of purposes in laboratories all over the world. In fact, a typical laboratory is estimated to use around five-times as much water as a comparably sized office block – that’s about 35 million liters per year. But how much do you really know about the water you’re using for your experiments? Due to its incredible solvent properties, water mixes with and dissolves a wide variety of substances - meaning lab water sources contains many different contaminants. Even trace levels of impurities can affect a variety of scientific applications – putting your results at risk. Drinking water needs to conform to local regulations and has acceptable clarity, taste, and odor. This is achieved by treating natural water sources, such as reservoirs, rivers or underground aquifers through a series of steps, which vary with the water source, local and national regulations, and the choice of technologies. So, it’s easy to appreciate that water will vary significantly from one geographical location to another - and it can even change from season to season. Water is a source of variability in your experiments that you can’t afford to ignore. Why Should You Worry About Impurities in Your Lab Water? As a scientist, we know that you care about getting reliable, accurate results from your experiments. And, as you will be all too aware, producing good data from your experiments is highly dependent on the quality of your reagents. You wouldn’t dream of cutting costs using a sub-standard enzyme or chemical reagent - it’s just not worth the wasted time and frustration of failed experiments or unreproducible results. And it’s no different with laboratory water, that frequently-used substance that underpins so many scientific and medical applications. Making sure that you use the correct level of water purity is an easy step towards producing consistent, accurate results. What is Ultrapure Water and What is it Used For? Ultrapure water, also known as Type 1 Water, reaches the theoretical ideal levels of purity, with a resistivity of 18.2 MΩ.cm, TOC < 10 ppb and bacterial count <10 CFU/ml. Endotoxins are also removed, and as such ultra pure water typically contains <0.03 EU/ml, with nucleases and proteases at non-detectable levels. Ultrapure water is an essential and critical reagent used in many highly sensitive scientific applications like HPLC, LC-MS, GC-MS, GFAAS, PCR and mammalian cell culture, as well as clinical analyzers. How Do You Know When To Use Ultrapure Water? It’s obvious that different techniques require different water purity levels. So, you don’t need to use ultrapure water for washing your glassware, but it is absolutely essential for highly sensitive analytical techniques such as HPLC - where even low levels of contamination can ruin experiments. What limits are considered right for what applications? How is laboratory water categorized into different grades or types? There are several parameters used to measure various properties of water as a way of assessing its quality. And around the world, international boards have created standards for laboratory water quality across all industries. Some laboratories will also adopt standards outlined in the European, US or Japanese Pharmacopoeia. At ELGA, we understand that working out the best water purity for a variety of specific application can be challenging – going too far will result in unnecessary expense or not far enough will endanger your results. So our experts have done the hard work for you! In our latest white paper, we have created an easy-to-use system that classifies water purity into broad types as well as a more detailed list of common applications and the water purity they require. 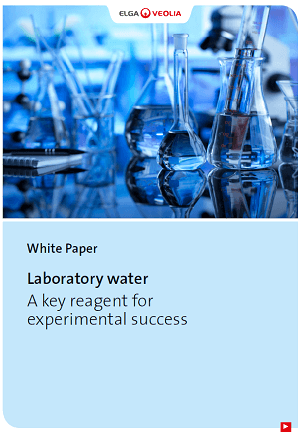 Together, these will help you to match your application with the recommended level of water purity quickly and effectively – giving your experiments the best chance of success at the most economical cost. Also in our whitepaper, we share ELGA’s expert knowledge about ultrapure water, which we have gained since the 1950’s from pioneering water purification technologies. We explore the different levels of water purity from ultrapure to CLSI water and look at some of the challenges around choosing what to use for a successful experimental outcome at the most economical cost. And we discuss the different options available for achieving a reliable source of purified water in your laboratory. CLICK HERE TO Download FREE Your Copy Today!